Gladiolus stalks are cut and shipped to florists when they are in bud. This ensures that the flowers will be freshly blossomed when they are placed in floral arrangements. Buds that have emerged from the greenery and have a good show of color are nearly ready to blossom out. If you have cut gladiolus spikes from a flower bed or have purchased them from a florist, you can get the buds to start opening up to the full blossom stage. The best time to harvest a gladiolus spike is when the second floret has blossomed out. Gladiolus spikes blossom from the bottom upward. Fill a tall bucket with about 6 inches of lukewarm water. 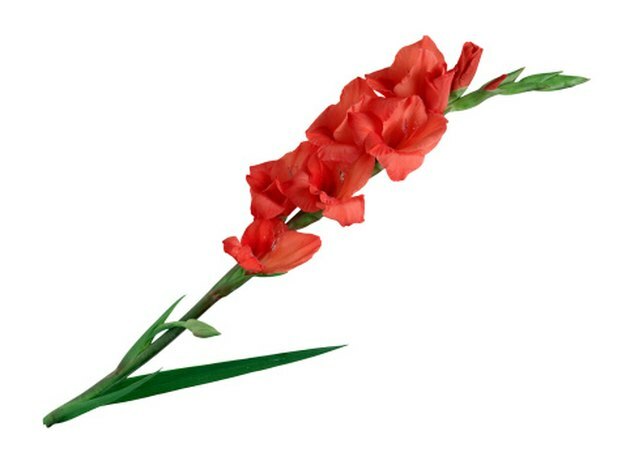 Cut the gladiolus with a sharp knife by slicing straight through the spike. The flowering spikes should be harvested in the early morning hours before the heat of the sun is on them. Leave at least four leaves on the plant to support the corm for future planting. Cut the gladiolus spikes on a diagonal slant with a sharp knife under water in the sink. Fill a vase with lukewarm water. Place the glads into the vase. Set the vase in a room that is warm. Place the glads away from an area that has any draft, fan movement or air conditioning which may hamper the blooming stages. A cool room will also keep the flowers from blossoming out.